Target Report: Can Ty Montgomery, Randall Cobb keep up their rushing production? The Play Index tool on Pro-Football-Reference—and all of the Reference sites, for that matter—is quite handy, and it’s going to be right at the center of the Week 7 Target and Snap report. Once you understand how to navigate it, you can easily search through the annals of NFL history, finding the last time a player rushed for 200 yards in consecutive weeks before Jay Ajayi achieved the feat (Ricky Williams, December 2002), how many times a player has had 15 receptions (27, most recently Antonio Brown last December), or almost any other stat, streak or frivolity your heart desires. Last week, the Packers’ two leading rushers, both in carries and yards, were wide receivers. Ty Montgomery ran nine times for 60 yards, while Randall Cobb carried the ball five times for 21 yards. The Play Index only has positional data going back to 1999, and as you’d likely imagine, there haven’t been many instances of receivers running the ball that often in one game. To see two receivers do so on the same team was unprecedented. Before Montgomery and Cobb stanched the bleeding in the Green Bay backfield last week, there had been 26 instances of receivers with five or more carries in a game since 1999. Josh Cribbs, who was more of a kick and punt returner than a receiver, had at least five carries in a game nine times. Percy Harvin, who once appeared destined to be the record holder for this pseudo-stat, did it seven times. Tavon Austin is the owner of four games with five carries, putting him in line to catch Harvin at some point in his career. Brad Smith is the only other receiver with multiple five-carry efforts, putting up three across two seasons. Finally, Dennis Northcutt, Jarvis Landry and James Thrash check in with one such game. Montgomery and Cobb added their names to that list last week, but they also created a new one. Montgomery became the first wide receiver in NFL history with nine carries in a game. The previous record belonged to Cribbs, who had eight carries for 87 yards in a 13–6 Browns win over the Steelers in December 2009. The duo, meanwhile, became the first pair of receiver teammates to combine for double-digit carries in a game. Their mark of 14 totes is unlikely to be topped for some time, unless, of course, they do it at some point this season. Just how much rushing production can we expect out of Montgomery and Cobb, especially the former? While it was nice for Cobb to add another 2.1 points to his bottom line on the ground last week, he doesn’t need the rushing production to show up for his fantasy owners. Montgomery likely does, especially with Davante Adams distinguishing himself in Green Bay’s Week 7 win over the Bears. The Packers signed Knile Davis before last week’s game, and while he wasn’t part of the offense in his first game with the team, we can bet on seeing a lot more of Davis this week. James Starks should be back in the next couple weeks as well, and that will take even more rushing duties off of Montgomery’s plate. Now, to be fair, he was quite effective as a runner in the win over the Bears, so it’s unlikely the team will completely cut him out of the backfield. Still, he’s likely just a short-term fix. Montgomery still slots as a WR3 this week, thanks to his rushing production and the bye-week carnage, but games like last week are still likely to be the exception, not the rule. With that, let’s get to the rest of the Week 7 Target and Snap Report. When the Packers headed into their Week 4 bye, Cobb was a total mess. Through three games, he had 12 catches for 132 yards. He was working on droughts of 17 games without hitting 100 yards and nine without a touchdown. At that point, his owners were justified in wondering just how often he’d start for them the rest of the season. But the WR looked like a new player when the Packers faced the Giants in Week 5. He had three catches on the Packers’ first possession of the game, and nearly matched his previous season-high in yards on that drive alone. He went on to break one of those ignominious streaks, totaling 108 yards on nine receptions. He nearly broke both, but had a touchdown called back because of an illegal shift penalty. Now that he was rolling in the offense once again, though, it wouldn’t take him long to find the end zone. Cobb hit paydirt last week for the first time since November of 2015, exorcising the final demon that plagued him for nearly a full year. Cobb put it all together last week against the Bears. He caught 11 passes—his most in a game since hauling in the same number in a win over the Buccaneers in Week 16 of the 2014 season—for 95 yards and a score. He had another would-be touchdown knocked out of his hands at the last second, and was forced out after securing another end-zone target. In other words, he was inches away from one of the biggest receiver performances of the year. The 15 targets he had against the Bears were a new career high. Roll up the last three weeks, and Cobb has been one of the best fantasy receivers in the league. His 37 targets during that span are tops among receivers, just edging DeAndre Hopkins. He has 27 catches for 256 yards and two scores, which comes out to 12.53 points per game in standard-scoring leagues. What’s more, the Packers committed themselves fully to the short and intermediate passing game last week, an attack that suits Cobb’s skill set. I’m fully buying Cobb as a strong WR2 for the rest of the season. Last week, Johnson produced a usage line seen in the NFL just three times in the last 10 years. Johnson had 33 carries and eight receptions, joining Arian Foster (November 2010) and DeMarco Murray (December 2014) as the only backs over the last decade with at least 30 rushes and eight catches in a single game. Going back to 1960, the Play Index tells us that there have been 13 such instances, with 10 backs producing those games. James Wilder, LaDainian Tomlinson and Edgerrin James all had two 30-carry, eight-catch games in their careers. That’s some mighty fine fantasy company. Johnson turned his 41 touches into 171 total yards in last Monday’s 6–6 tie between the Cardinals and Seahawks. He now has 146 carries, 28 receptions and 46 targets on the year. Johnson is second among backs in rushing yards (681), first in carries, tied for first in rushing touchdowns (eight), second in receiving yards (323), tied for third in receptions, and first in targets. Johnson isn’t just getting the volume to sustain his rank as fantasy’s No. 1 overall player. He’s also doing more with that volume than anyone not named Le’Veon Bell is capable of doing. Let’s take a look at the five backs who had 30 carries and eight receptions in a game most recently before Johnson. In addition to Foster in 2010 and Murray two years ago, Tiki Barber did it in 2002, Tomlinson hit those thresholds for the second time in his career the following season, and James posted his second such game in 2005. In the seasons in question, those five players produced an average line of 1,599 rushing yards, 13 rushing touchdowns, 67 receptions, 535 receiving yards and one more score through the air. Showing the difference of the times, though, none of Barber, Tomlinson or James were the top-scoring running backs in those respective seasons. Johnson almost surely will be. Johnson is on pace to add to that lore, tracking for 1,556 rushing yards, 18 rushing touchdowns, 64 catches and 738 receiving yards. In standard-scoring leagues, that would translate to 337.4 points. That would be the most fantasy points by a running back since Chris Johnson had 340.9 in his 2,000-yard season of 2009. Consistency is imperative for a player to be considered an elite fantasy weapon. In general, you’d rather have a player who consistently scores 15 points rather than one who puts up 25 points one week and five the next. It’s a point we made all throughout prep and draft season, and one that remains important in the regular season. Michael Thomas has found that consistency in his rookie year. The Ohio State product has scored at least 10.4 standard-league points in all of his last four games. During that time, he has 26 catches on 38 targets for 323 yards and three touchdowns, good for an average of 12.58 points per game. Thomas has had at least 13 points in three of those games, finishing as a top-16 receiver in all of those weeks. He hasn’t been out of the WR2 class since the second game of his career. Thomas is on pace for 96 catches and 1,165 yards, both of which would be franchise rookie records. While Thomas has been consistent, teammate Brandin Cooks has been more boom-or-bust. He has two games this season with at least 24.3 standard-league points, and two more with fewer than four points. Thomas has four more receptions than Cooks (36 to 32) while the third-year player out of Oregon State edges the rookie in targets (50 to 49). Willie Snead is third across the board, remaining useful in all fantasy formats, but not quite locked in as a starter. The lack of a clear No. 1 receiver isn’t a new development in New Orleans during the Drew Brees era. Outside of the prime Marques Colston years, Brees has always spread it around to the point that no receiver is a WR1 in the fantasy world. It appears that’s what we have this season, as well. Thomas and Cooks are both worthy WR2s, with the former more consistent and the latter owning a higher ceiling. Ajayi has taken the fantasy world by storm the last two weeks, running for at least 200 yards in both of the Dolphins games while scoring a total of three touchdowns. At this point, he’s the odds-on-favorite to be this year’s second-half breakout player who swings regular season and playoff championships. If someone else ends up earning that title, however, we likely won’t have to leave the state of Florida to find him. Jacquizz Rodgers has had two big games filling in as a starter for the injured Doug Martin in Tampa Bay. Rodgers rode 30 carries and five receptions to 129 total yards in his first game in command of the Bucs’ backfield. He was more efficient last week, totaling 154 yards on 26 carries, good for a new career high. We can fire up the Play Index once again to learn that Rodgers became exactly the 100th player since 1960 to post consecutive games of at least 26 carries and 100 yards. Seventeen of those instances have come over the last five seasons, with names like Adrian Peterson, Marshawn Lynch and Arian Foster dotting the list. Volume is the fantasy lifeblood for running backs and receivers. Quarterbacks need to be efficient to survive, but backs and receivers can get by on opportunity alone. It appears Rodgers will get that opportunity. All indications are that the setback Martin suffered in practice last week will have him out for the foreseeable future, making Rodgers a real weapon in fantasy leagues. He has enjoyed favorable scripts in both of his starts, and that likely won’t be the case every week. Still, he’s the only show in town in the Tampa Bay backfield. He’ll project as, at worst, a top-20 back every week he starts. It’s not uncommon, especially in today’s NFL, for a pair of receiver teammates to be able to regularly post weekly WR2 or better numbers with consistency. In all of the last four seasons, at least one team has produced two top-12 fantasy receivers. Last year, it was the Jets with Brandon Marshall and Eric Decker. In the three seasons before that, there were two teams with a pair of top-12 receivers: Denver (Demaryius Thomas, Emmanuel Sanders) and Green Bay (Jordy Nelson, Randall Cobb) in 2014, Denver (Thomas, Decker) and Chicago (Brandon Marshall, Alshon Jeffery) in 2013, and Denver (Thomas, Decker) and Atlanta (Julio Jones and Roddy White) in 2012. The pairings above are WR1 combos. There are too many teams over the last five seasons with at least two WR2s—more typically one WR1 and one WR2—to list here. The point is that it happens in abundance every season. For whatever reason, one of the best receiver duos in the league this season can’t seem to get out of one another’s way. Through Week 7, Michael Crabree is the No. 7 receiver in standard-scoring leagues, while Amari Cooper checks in at No. 14. Crabtree has 39 catches for 461 yards and six touchdowns, while Cooper has hauled in 40 balls for 614 yards and one score. Cooper’s poor touchdown rate notwithstanding, it would seem that these two should be able to regularly produce alongside one another. 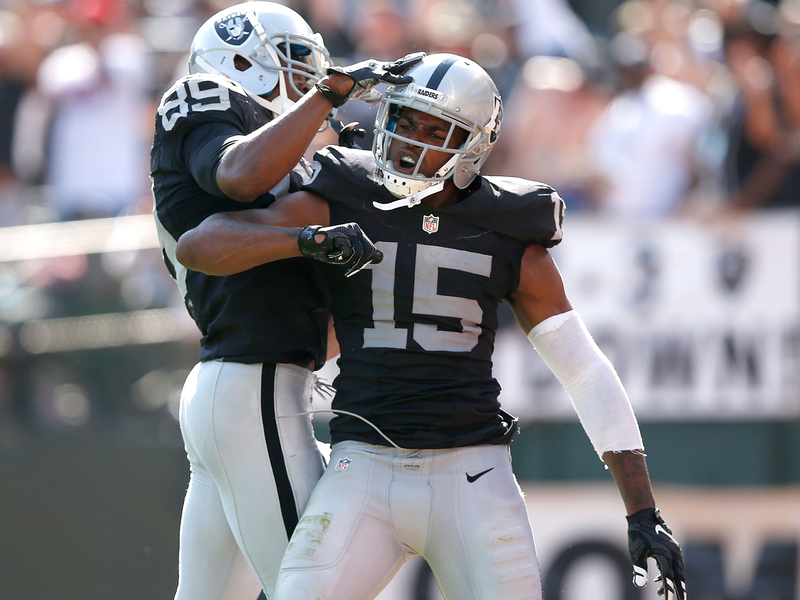 After all, Crabtree is pacing for 89 catches, 1,053 yards and 13 touchdowns. Cooper is on track to pull down 91 passes for 1,403 yards and a pair of trips to the end zone. With similar overall numbers last year—Cooper’s touchdowns are the only outlier—Marshall and Decker gave the fantasy community 10 weeks where both were top-24 receivers. The pair ranked in the top 20 in the same week four times. Cooper and Crabtree have yet to produce one game this season where both finished in the top 20 at the position. Just once, in Week 5 against the Chargers, have both ended up inside the top 24. In every other week, at least one of the two has been ranked 33rd or worse. Five times this season, one of Cooper or Crabtree has ended up outside the top-40 receivers for the week. In short, it seems safe to bet that one, and only one, of the two will produce every week. If we take a look at the target numbers, we see that Derek Carr rarely features both receivers in the same game. Just twice this year have both Cooper and Crabtree had nine or more targets in the same week. Lower the threshold to seven targets, and you add only one more game to the ledger. Owners of Cooper and Crabtree are going to run them out there every week, and with good reason. Seven weeks is a pattern, though. This isn’t a pairing like Marshall and Decker last year or Thomas and Sanders the year before that. These two aren’t likely to both show up for their fantasy owners week in, week out. Chicago: Ka’Deem Carey out-snapped and out-touched Jordan Howard last week. Carey played 26 snaps and got 11 touches, while Howard was on the field for 22 plays, getting the ball in his hands seven times. So much for Howard dominating the backfield. Jeremy Langford could also be back after Chicago’s Week 9 bye. Denver: C.J. Anderson and Devontae Booker both ran wild over the Texans last week. Anderson had 16 carries for 107 yards and a touchdown, while Booker ran the ball 16 times for 83 yards and a score. Booker played six more snaps, which is an alarming development for Anderson owners. Still, Anderson remains the starter, and the game script led to the Broncos pounding the rock on the ground in the second half. That inflated Booker’s carry total. Detroit: With Theo Riddick out last week, Zach Zenner and Justin Forsett split the touches right down the middle. It was Zenner, though, who played twice as many snaps and converted a goal-line carry into a touchdown. Both players could be of note in deeper leagues with six teams on bye both of the next two weeks, but their value is limited to those formats. Jacksonville: It’s the Giants of the AFC. Does it really matter what Chris Ivory and T.J. Yeldon did individually if the Jaguars can’t get anything going on the ground as a whole? No, it doesn’t. But for the sake of continuity, I’ll let you know that Ivory ran five times for 48 yards, while Yeldon picked up 24 yards on six carries. Yeldon played 38 snaps to Ivory’s 27, but didn’t make anything happen in the passing game. Neither should be near your starting lineup. Minnesota: Matt Asiata was more productive than Jerick McKinnon for the second straight week, running for 55 yards on 12 carries, compared with 43 yards on 11 totes by McKinnon. What’s more troubling for McKinnon backers is that, against all odds, Asiata has been the better receiver of the two. Last week, Asiata out-snapped McKinnon for the first time since Adrian Peterson went on IR. What was once a 65-35 split in favor of McKinnon looks a lot more like 50-50, with Asiata handling the goal-line work. New York Giants: Who cares? I’m serious, does anyone care? Rashad Jennings played half of the Giants snaps last week, running for 25 yards and a touchdown on 13 carries. He also caught two passes for 24 yards. This counts as a positive fantasy day for him. Paul Perkins had four carries for 12 yards while playing 15 snaps. No one in this backfield deserves your trust. New York Jets: Matt Forte was back in full command of the Jets backfield, playing 83% of the snaps and racking up 34 touches. He totaled 154 yards and two touchdowns. Bilal Powell, meanwhile, had four touches, all on the ground. Powell may have been eating into Forte’s snap and target share the last month, but he wasn’t exactly setting the world on fire. Forte could be back inside the workhorse club. Oakland: Latavius Murray returned to action for the first time since Week 4, running for 59 yards and two touchdowns on 18 carries. DeAndre Washington, Jalen Richard and Jamize Olawale combined for nine carries and three targets. They’ll mix in, but Murray comfortably leads this backfield. Philadelphia: Ryan Mathews once again dominated the carries, getting 14 compared with seven total for Darren Sproles and Kenjon Barner, but he turned those 14 carries into 56 yards. Mathews isn’t going to be a per-touch monster, and 15 or so touches per game isn’t likely to lead him to RB2 numbers without a touchdown. Seattle: Christine Michael is in total command of this backfield, but there was one interesting development last week. C.J. Prosise played 16 snaps in his return to action, catching two of his three targets for 17 yards. Those of you in deep leagues might want to add him, just in case his role grows. With 20 teams going on bye the next four weeks, Prosise could come in handy in deeper formats. Washington: Matt Jones found himself in the doghouse because of his fumbling ways last week, opening the door for Chris Thompson. The latter played 43 of 73 snaps, getting 12 carries and seven targets. Jones likely remains the team’s primary runner, but Thompson picked up 73 yards on his 12 carries. If he can secure a role where he gets just six or eight carries per game, he could enter the RB2 and flex discussion in standard formats.